There are 267 recipients of the Navy Cross which was awarded for exemplary and heroic service during the Korean War. Two men earned TWO Navy Crosses in Korea. 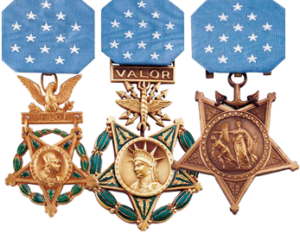 John Page, US Army, earned the Navy Cross and the Medal of Honor in Korea. Lewis Puller, US Marine Corps, earned his 5th Navy Cross and the Distinguished Service Cross in Korea. Four WWII Navy Cross recipients earned a 2nd award in Korea. One Korean War Navy Cross recipient earned a 2nd award in Vietnam.